So here I am back to Goma after a good break back in Athens and other places. This time the strawberry pie story starts with myself crossing the borders from Rwanda to DRCongo. Waiting for my passport to get stamped across the DRC side a couple of young ladies with huge baskets full of freshly picked strawberries started harassing me to buy some. My travelling adventure and the 3 pieces of luggage I was carrying full with training materials for a workshop I had to facilitate in Goma didn’t allow much space for more shopping at the time. However here I am a day later asking from our house lady to spot some strawberries for me. Still no thoughts about strawberry pie. An hour later she comes back with a plastic bag and a couple of kilos of tiny freshly picked strawberries that smelled like heaven. 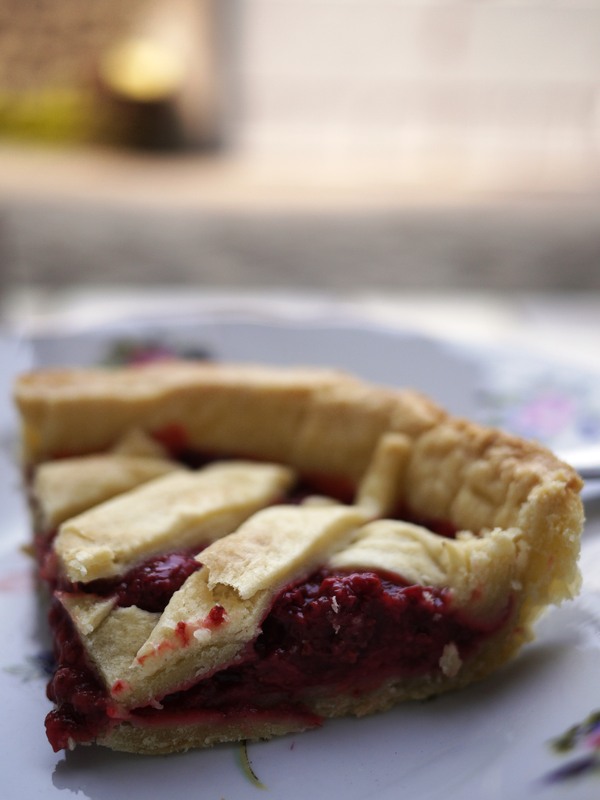 Childhood memories popped up when I was spending my summers at summer camp up to Taigetos mountain and part of our Sunday activities included picking wild strawberries to cook giant baking pans of strawberry pies. 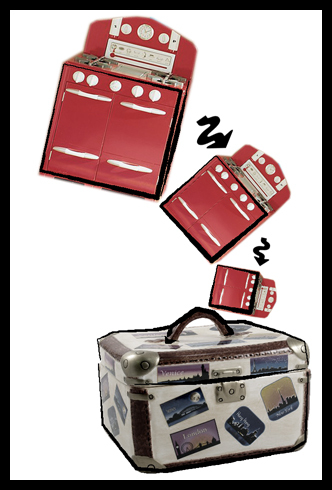 So here is the puzzle of events and a recipe of strawberry pie. With love from Goma. Breakfast at Goma. 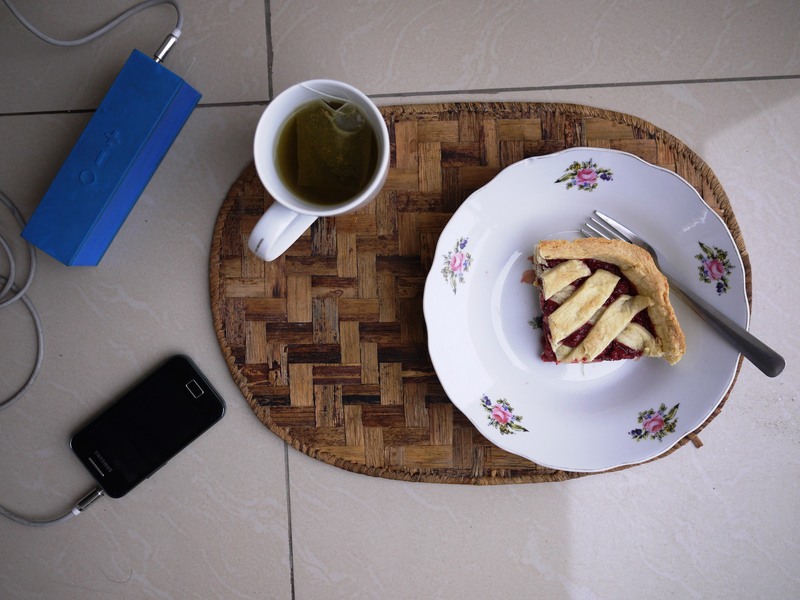 Strawberry pie, sage tea and some fine tunes to go along with the sunny Sunday morning. Start with preparing the filling. In a heavy bottom sauce pan add the strawberries and the lime juice. Cook, stirring occasionally in very low heat for 40-45 minutes. This will bring out juices from the strawberries. Add the caster sugar and bring to boil over high heat. Stir frequently. At this stage is better you stay on top of the pan and keep an eye while stirring for 15 minutes. Reduce hit if you feel your strawberries are burning. All you need a syrup-liked mixture. Set aside to cool down to room temperature. In a bowl add the dough ingredients and mix with your hands. You may also use a food processor. Then cover in cling or baking sheet and put aside in the freezer for 30 minutes. I didn’t have either so I used a super market bag instead that worked well. Preheat the oven to 200 C. Remove dough from freezer and use 2 baking sheets or 2 pieces of plastic bag in my occasion to roll the dough. 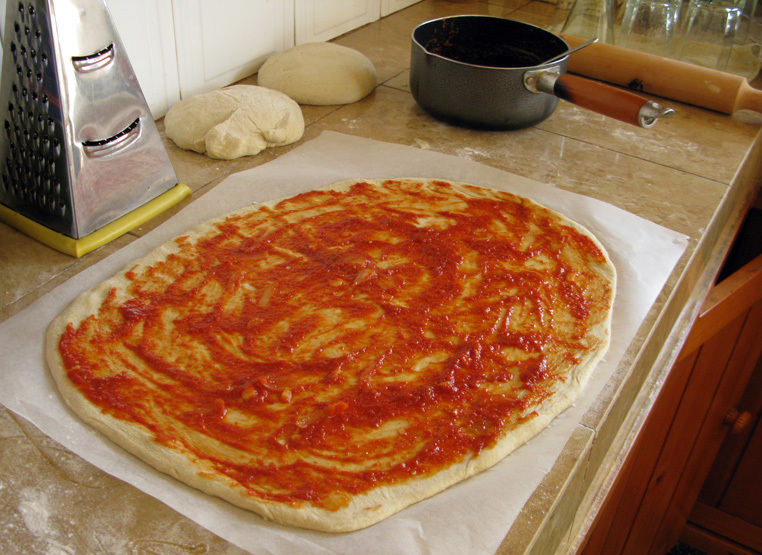 You will need approximately a 2cm thick dough layer for your base. If your dough feels sticky you can place back in the freezer for another 10 minutes before removing from the baking sheet or plastic bag. Place the dough in a 22cm round baking pan. This is only a guide so be creative about the pan. This time I used a small size square pyrex baking pan for example, which is what we had in the kitchen. 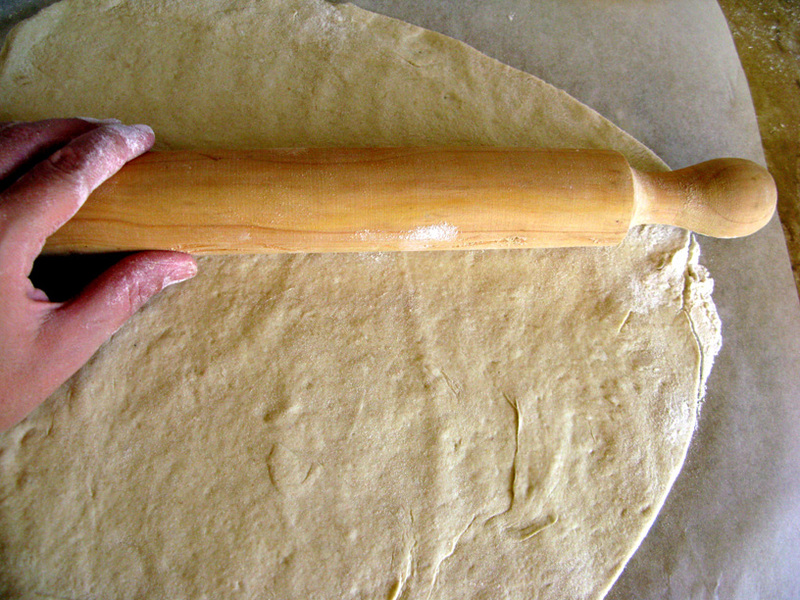 Trim the edges with a knife and prick the dough with a fork several times. Place the remaining dough in the freezer again. Bake the base for 20 minutes or until lightly golden. While baking pay attention and use a spoon to push down any rising dough or instead put a baking sheet and add some uncooked rice on top to keep the dough from rising. If you use rice remove after 15 minutes so you allow your pie to get crispy. 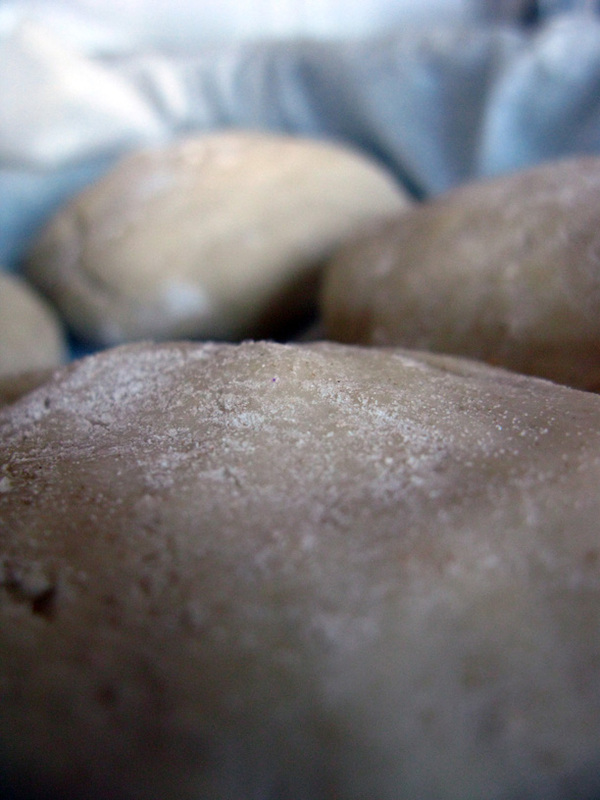 Remove the remaining dough from the freezer and using the same technic as before roll it to a 1cm thick layer. Then cut to 1cm wide strips with a cold knife. Add the filling in the base and place the strips on top of the filling. Bake again at the preheated oven to 200 C for 25 minutes. When ready put the pie aside to cool down a little bit before cutting into pieces. YOu can remove from baking pan and let it cool down on a oven rack. This will keep your pie crispy until next morning. Pizza is one of my favourite dishes. It is easy to make and also a good excuse to use any left overs or veggies that are turning bad in your fridge. You can be extremely creative by topping up the dough with whatever you can imagine. My favourite base sauce is canned tomato paste shimmered for a few minutes with onions, loads of garlic, oregano and a bay leaf and sometimes grated fresh tomato. There were times though that I just used ketchup,spicy sauces or even creamy-white cheese sauce. 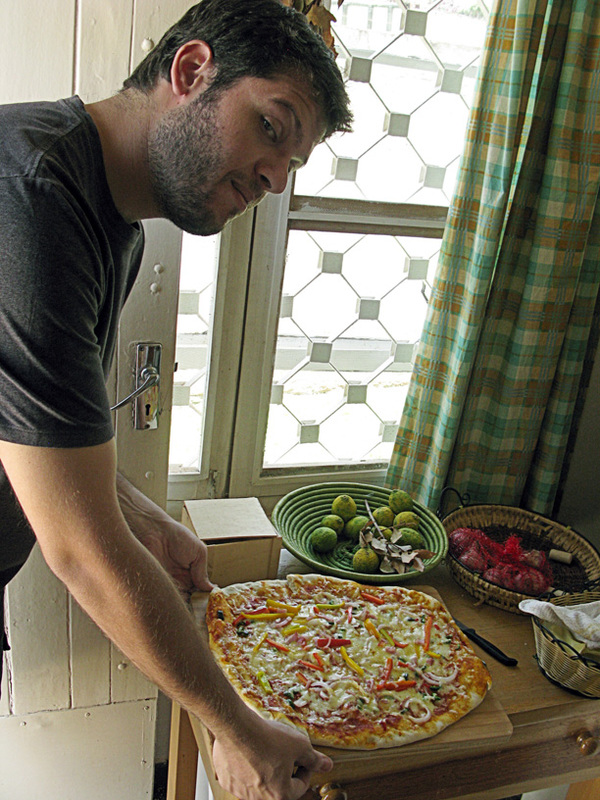 I usually make pizza dough once per week or even once per two weeks and keep it in the fridge. George handling the pizza before final cut! Stir together the flour, salt and yeast in a large bowl. stir in the oil and cold water with your hands until all the flour is absorbed. Mix for 5-7 minutes until the dough is smooth and sticky. Sprinkle some more flour in as needed. Transfer the dough to a floured surface and cut into six equal pieces. Line a sheet pan with baking paper and lightly oil it. Sprinkle a bit of flour on the dough and gently shape them into balls. Place the dough balls on the sheet pan and slip the whole pan into a large ziploc or plastic super market bag. Put the pan in the fridge overnight to rest. They will keep in the fridge for 3 days (or in the freezer for up to 3 months). My dough-balls resting before refrigeration. When it is time for pizza remove the dough from the fridge 2 hours before. Dust the counter with flour, place the number of dough balls down you are going to use, and sprinkle with more flour. Gently press them into flat disks (about 1/2 inch thick). sprinkle with a bit more flour and cover loosely with plastic wrap. Let rest. lay it on the pizza peel,pan or straight on baking paper and top lightly with your favorite sauces, cheeses, veggies and meats. Keep in mind that this is a pretty thin crust; so a little topping goes a long way. 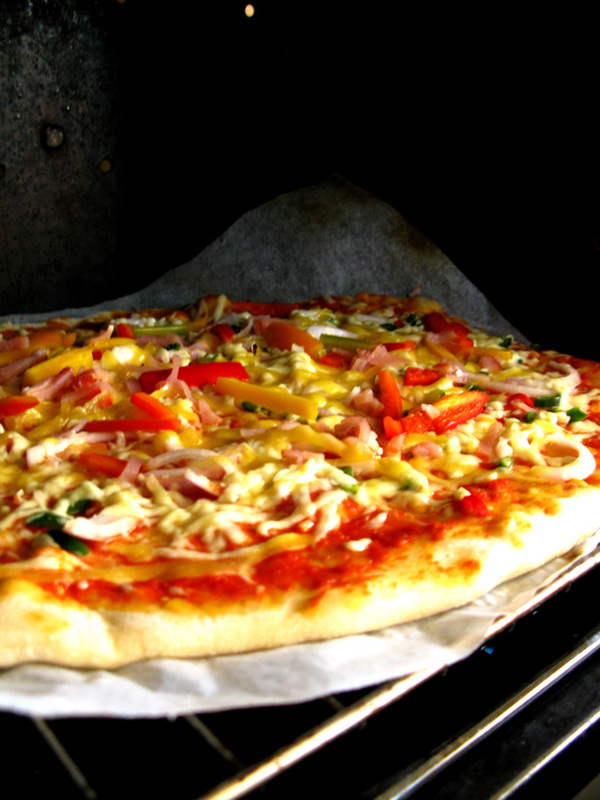 Preheat the oven in high temperature, place the pizza close to the bottom of the oven. Bake for 10-12 minutes. The edges will puff a little bit, darken and crisp up. Remove the pizza from the oven and transfer to a cutting board. Wait a few minutes for the toppings to set before slicing and serving.